This morning, Haute Time received an exclusive first look at Audemars Piguet’s new Royal Oak Perpetual Calendar. To understand how important this watch is to the brand, we spoke to Michael Friedman, Historian at Audemars Piguet, and got his insight into the brand’s new icon. When we visited the brand’s private museum together last year, you showed me what you called “the rarest watch ever made by Audemars Piguet,” a perpetual calendar wristwatch from 1955. Can you clarify why it is such a rare watch, and tell us where the perpetual calendar complications ranks at Audemars Piguet? It was one of only nine perpetual calendar watches with leap year indication made between 1955 and 1957. Three examples were made in 1955 and six in 1957. They all carry individual characteristics, so they are all actually unique. The watch we saw together was Reference 5516, No. 73011. It had only just been acquired by the museum and arrived to us in absolute original and unrestored condition. Just as it was sold when it was first made. The dial was untouched, the edges unpolished, and the watch really showed no aging at all other than the expected patina. It’s so rare to find a watch over a half century old that is totally preserved. So not only do you have something so rare, but also barely touched and completely unrestored. I would call it a once in a career moment. As a complication, the perpetual calendar is vital to our history. It’s a little window deep into our past. It totally embraces the field of astronomy from which all of horology is derived. In fact, long before the invention of the pendulum and balance spring, we had astronomical clocks and watches with phases of the moon. We tend to forget it in the modern day, but many tens of thousands of year before we even had language or technology; humankind had this relationship with the night sky. I don’t think the importance of this iconography is still entirely understood. A lot has changed between the brand’s first perpetual calendar and the new Royal Oak Perpetual Calendar, including of course the size of the watch. How different are the two watches, and do they share any common traits? The spirit of innovation is present in both watches. But I would say the latest Royal Oak Perpetual Calendar actually has four reference points: the first perpetual calendar wristwatch (1955), the first automatic self-winding perpetual calendar caliber (1978), the first Royal Oak perpetual calendar (1984), and finally, the first Royal Oak perpetual calendar with a 52-week chapter ring (a limited edition for the brand’s 120th anniversary in 1995). The term “revolution” was used to qualify the launch of the Royal Oak Perpetual Calendar in 1978, the world’s thinnest selfwinding perpetual calendar wristwatch at a time when Quartz watches were the hottest property. Can we talk about a second revolution this year, or is it more of an evolution? When reference 5548, came out in 1978, there were only two brands making perpetual calendars, Patek Philippe and us. People forget this because perpetual calendars are so commonplace today, but most that emerged in the 1980s were based on the design of reference 5548. Today of course, perpetual calendars are immensely popular, but this year’s watch will be remembered for other reasons. It is an evolution in terms of technology, and a revolution in terms of design, in terms of legibility of the dial and authenticity. It’s a very well thought out and very well executed watch, and it honors the DNA of the Royal Oak. Photo Credit: Haute Time. 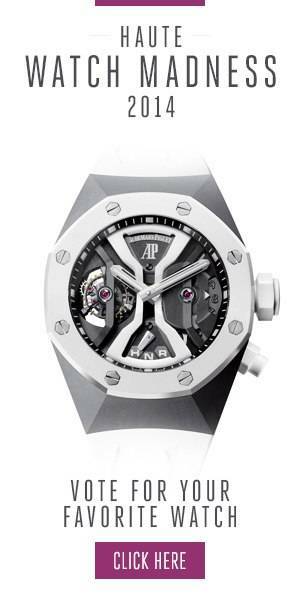 For more information, please visit the official Audemars Piguet website. Follow Haute Time on Instagram to catch all of the new releases as they happen.